The Sossusvlei is one of Namibia’s most well-known and popular attractions. 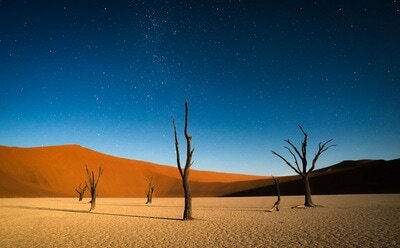 The Sossusvlei is a large salt and clay pan surrounded by high red dunes. The word sossus means dead-end in Nama and vlei means marsh in Afrikaans. The name dead-end marsh refers to the fact that it is the place where the Tsauchab River ends. 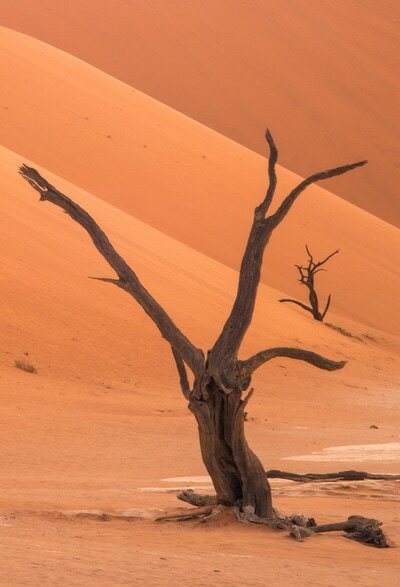 However most years the river doesn’t get as far as the Sossusvlei due to the dry conditions. When there is a very rainy year the vlei fills up with water, which makes for amazing sights. 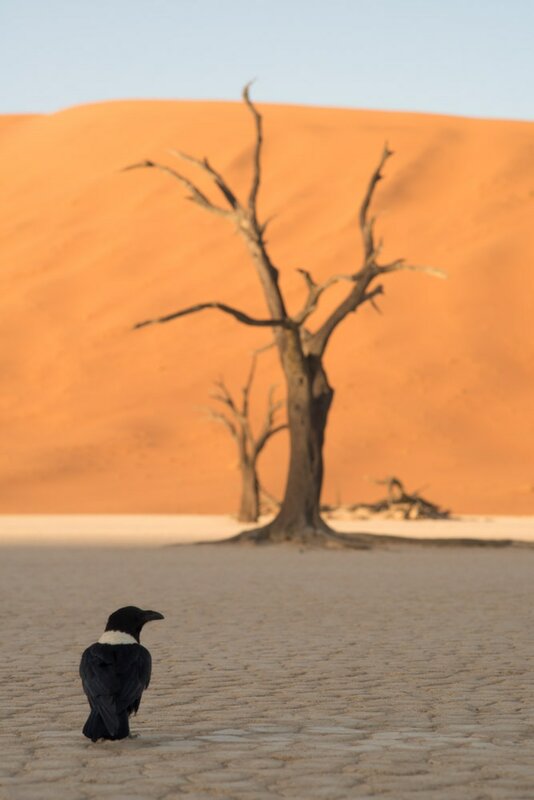 On first sight, the Sossusvlei may look dead and uninhabited but when you take a closer look you will discover it’s actually full of life. Its residents are mainly small animals that have adapted to the harsh environment. Some larger animals such as antelopes and ostriches have also managed to survive. The Elegant Desert Lodge is a perfect stopover for travellers on their way to the Namibian desert, but it is a destination of itself as well. The friendly and helpful staff will assist you with everything from a flat tyre to bookings. The accommodation fits the desert, with an elegant simplicity. The sunset is truly a spectacle, on request guests will be taken on a Sun Downer Trip to the edge of the mountains. Children of all ages are welcome at the Elegant Desert Lodge. Hoodia Desert Lodge consists of 11 luxury chalets, which have been built with a lot of space between them to assure your privacy. 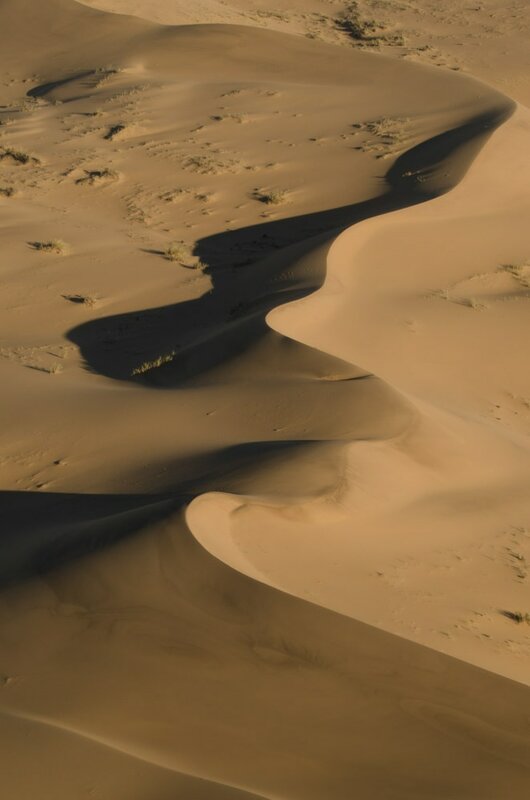 Each chalet has a private deck from where guests can marvel at the beauty of the Namibian desert. At night it is a perfect spot to look at the stars. Besides a normal shower the chalets also feature an outside shower. At the main building guests can relax at the shaded pool or in the lounge area. The restaurant contains a central fireplace, which gives you an amazing dining experience. No children below the age of 12 years are allowed. Le Mirage Resort & Spa At only 21 km from the Sesriem gate, Le Mirage is one of the closest accommodations to the Sossusvlei. The unique design of the lodge gives your stay a special touch. There are three different types of rooms available at Le Mirage Resort & Spa. Including two open air rooms situated on top of the round towers. The pool gives guests the chance to escape the heat of the Namibian desert. The Mystique Spa offers a variety of treatments as well as a Jacuzzi. Children of all ages are welcome at Le Mirage Resort & Spa. Prefer something different? Contact us to add Sossusvlei to an itinerary 'Tailor Made' just for you.